When it comes to love and family, Americans know that racial categories are unimportant. MORE THAN half a century after Martin Luther King Jr. exhorted Americans to judge each other by the content of their character, obsessive racialists continue to insist that people must be judged by the color of their skin. These days, the racialists aren't usually motivated by notions of group supremacy; they are more likely instead to march behind banners emblazoned "Diversity" or "Inclusion." Nonetheless, the race fetish — the regard for skin color or ethnicity as a supremely meaningful factor in human behavior — is as pernicious as ever. Few superstitions could be more illiberal. After all, the noblest teaching of 20th-century liberalism was that human beings must be treated by society without regard to the shade of their skin or the shape of their eye. A preoccupation with racial and ethnic categories is nearly always irrational and primitive. In Minnesota, every state agency has an affirmative-action plan for increasing the percentage of racial and ethnic minorities it employs; the state's official goal is for 1 of every 5 employees to be nonwhite. In Washington, school districts are required by law to draft a blueprint for hiring more racial minorities; a government body, the Office of the Superintendent of Public Instruction, is in charge of determining the "ideal" number of minorities each district should have. In Massachusetts, developers bidding to construct a hotel on state-owned land must meet a "diversity" threshold by including racial minorities among their investors and reserving significant chunks of the work for black- and Asian-owned subcontractors. The leitmotif that links these stories, and so many like them, is that racial identity is more important than character, personality, or merit. They are premised on the belief that individuals matter less than the demographic group they belong to. They deny the great truth that beat at the heart of the Civil Rights movement — that "classifications and distinctions based on race or color," as Thurgood Marshall expressed it in a 1948 brief for the NAACP Legal Defense Fund, "have no moral or legal validity in our society." All the more reason, then, to stand up and cheer the findings of a new Pew Research Center report on intermarriage in America. Next month brings the 50th anniversary of Loving v. Virginia, the Supreme Court case that struck down laws in 16 states that prohibited interracial marriage. Half a century after that landmark ruling, the Pew report documents, it has become common for couples to marry across the color line. The overwhelming majority of Americans now regard interracial marriage as either a matter of no particular significance (52 percent) or a positive good (39 percent). Only 9 percent still think marriage between people of different races is bad for society. 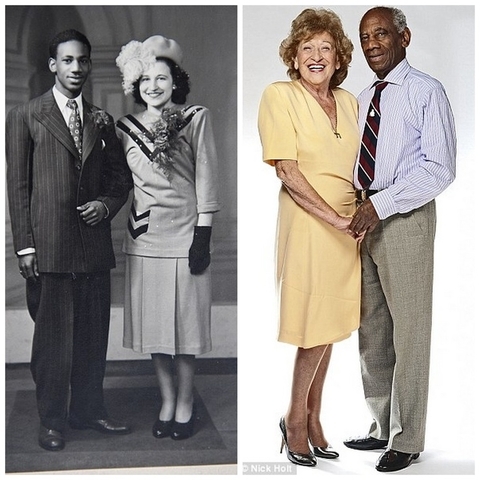 When Mary and Jake were married in 1948, interracial marriages were widely frowned on. In the course of their long and happy marriage, they've seen society's views change dramatically for the better. As recently as 1990, 63 percent of nonblack Americans said they would oppose the marriage of a close family member to a black person. Now just 14 percent of adults feel that way — and the opposition is most prevalent among the elderly. In matters of race, the transformation of American hearts and minds has been profound. In 1967, a mere 3 percent of newlyweds were of different races. A half-century later, 17 percent of all US newlyweds marry someone of another color. In contemporary American society, one of every six weddings unites couples from different racial backgrounds. That's a more than fivefold increase since Loving was decided. And the number keeps rising. Today, more than 11 million Americans are married outside the racial box. Millions more have dated someone of another race or ethnicity. When it comes to family, the American people have internalized the conviction that racial categories are only skin deep. In our own homes, where it matters most, color-consciousness is archaic. We value others not for the color of their skin, not for the label they check on census forms, but for themselves. Why do we tolerate anything less when it comes to politics, construction, and government employment?